For an early Father’s Day celebration a few weeks ago, I went with my aunt, uncle, cousin and my uncle’s mom to try Vintana, the new Cohn restaurant in Escondido (north of San Diego proper) that is creatively (?) located in a Lexus dealership. That’s right. It’s a little bit weird but we went with it! It’s actually kind of a brilliant marketing idea for Lexus, since you have lots of diners coming in and out and looking at your cars. Not very often that you get foot traffic at a dealership outside of people who are there to actually buy a car. Anyway, I was there for the food, not the cars, obviously. The restaurant is located on the third level of the dealership, and you take a glass elevator up from the ground floor to get there. The size of the restaurant was the first thing that hit me — it’s huge! There’s a bar area, outside patio, a sort of wine storage area you walk through to get to the actual dining room, and in addition to the main dining room there is at least one private room off to the side. The tables all have views out the front windows of the dealership which are pretty much floor to ceiling glass, and you can see the hills of Escondido in the distance and the dealership fountain out front. The view to the right isn’t so great — freeway. Ah well. Can’t win ’em all. The decor overall was beautiful — check out the cool chandeliers in the picture below. The place was hopping when we got there on a Sunday evening and the sun bathed the dining room in a nice glow as it went down (a little bit of an issue for the people facing the sun though). 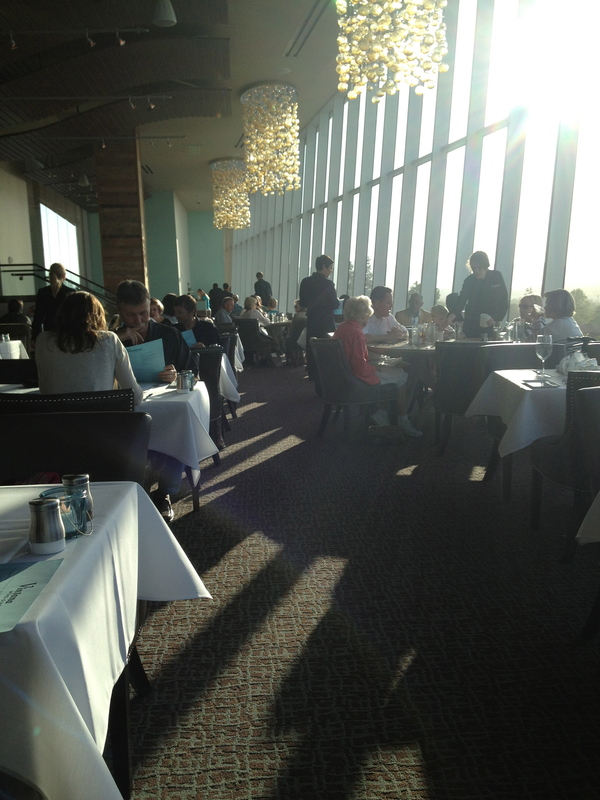 There was a nice, upbeat energy to the dining room and the staff were super nice and attentive. The restaurant had only been open for about 3 weeks and at that point, you know they’re still ironing out the kinks and getting things rolling along. But overall, I had a great experience and was very pleased with the service. One of my favorite parts of the meal were the ahhhh-mazing popovers they start you with, accompanied by butter that had a touch of spiciness to it. So good that I had to have 1 1/2 — and they’re not small. For my main course I tried the pan seared sea bass with white bean pistou, grilled artichoke, chorizo, roasted potatoes, stone crab wonton and lemon-poppy seed brown butter from the “Signature Offerings” part of the menu. 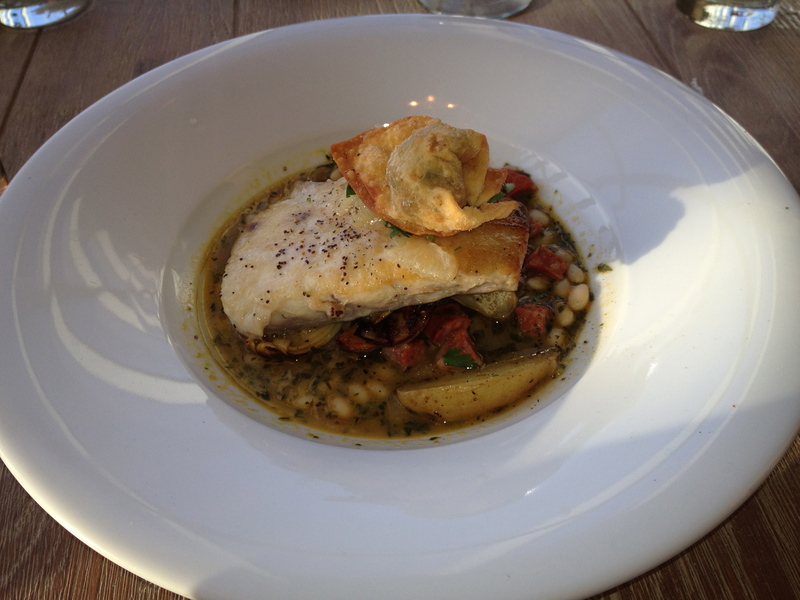 It was very tasty and the fish was cooked nicely — loved the incorporation of artichoke. One drawback to the menu from my viewpoint was that a good portion of it has you choose your seafood or steak and pair it with a compound butter or sauce. The butters/sauces sounded delish, but I tend to trust the chef to pair the sauce/butter with the protein that fits it best instead of having to think about what would go well. And it doesn’t include as many elements as the signature dishes, so I was unsure about how complete a dish I would be creating. I would just rather select a fully composed dish, I guess! My aunt and I also split the pomegranate molasses Brussels sprouts with black pepper bacon, raspberry vinegar and orange zest, which were okay but not my favorite Brussels sprouts ever. 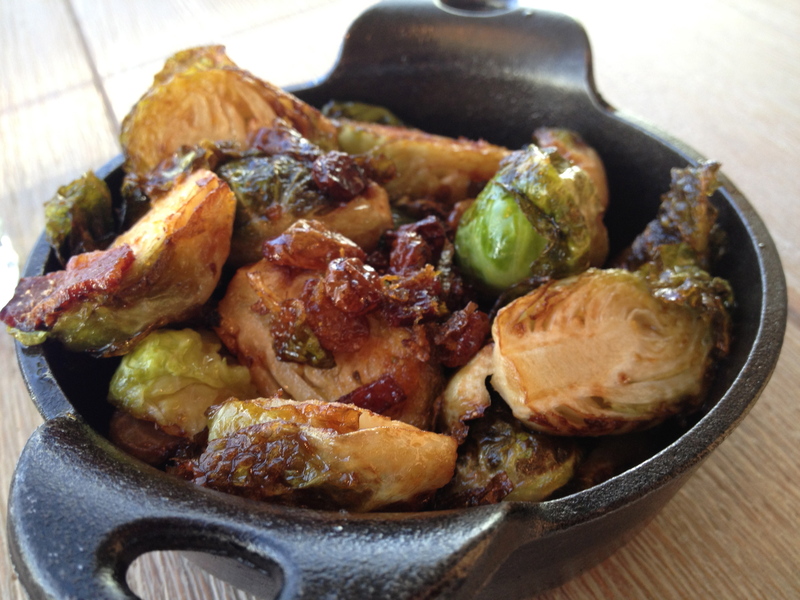 I’m a huge fan of Brussels sprouts, but these were a little bit undercooked and a tad heavy on the bacon (which I never thought I would say). Given the 30-minute drive to get there and with a plethora of Cohn restaurants closer to my neighborhood, I don’t think I’ll find myself in the position to eat here often, but it’s definitely a nice addition for Escondidans. Note: if I found myself there again, I’d love to try the sweet potato and pork belly hash and pan seared local greens for sides. And approximately eight more popovers. Maybe it’s a good thing I live far enough away to put some distance between me and those popovers! 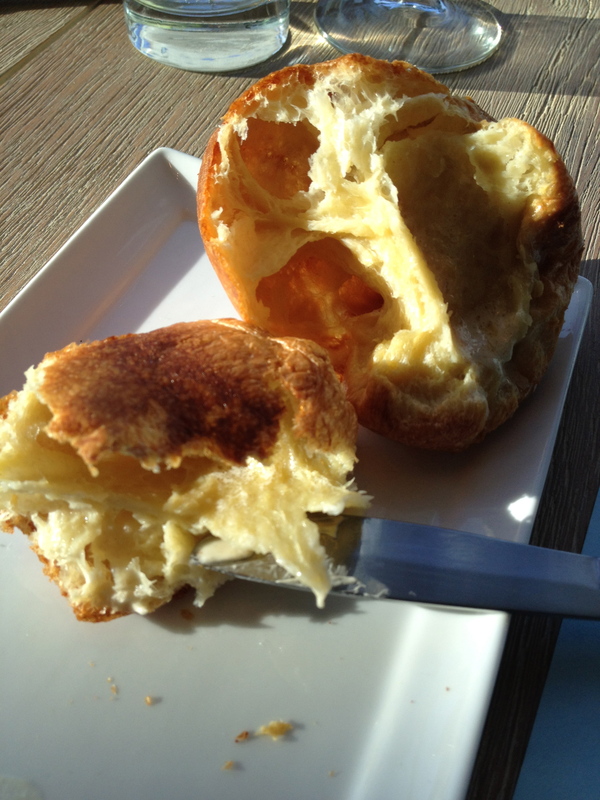 This entry was posted in Restaurants, Uncategorized and tagged Escondido, popover, San Diego, Vintana by Tricia. Bookmark the permalink.